Posted on July 19, 2016 at 5:23 am. 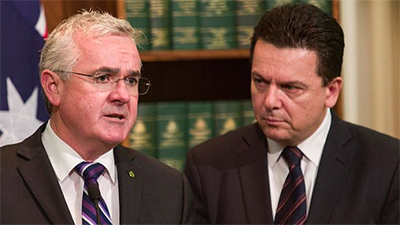 Tasmania’s Andrew Wilkie and South Australia’s Nick Xenophon have teamed up to get the pokies reform back on the national agenda, with the intention of recreating the Joint Select Committee on Gambling Reform that was active during the Gillard government. The reform aims to enforce a $1 maximum bet on all pokies, plus a ban on betting services being advertised during G-rated television programs. Back in 2010, a pokies reform was a condition of Wilkie’s support for the Labor party, but he withdrew his support when the reforms didn’t quite cut the major overhaul he was looking for. The call for the reform has sparked heated debate, with Wilkie’s participation being criticised by his political opponents who have accused him of striking a deal with Malcolm Turnbull despite his fellow Tasmanians rejecting the coalition at the polls during July’s federal election. Clubs Australia Executive Director, Anthony Ball, said the $1 maximum bet policy had already been rejected by two Parliamentary inquiries, one of which was chaired by Andrew Wilkie himself. Wilkie has accused the major political parties of holding off on addressing the issue of problem gambling due to their reliance on the funds generated from the gambling industry. He has now teamed up with anti-pokies renegade, Nick Xenophon, to see how they can influence the upcoming government on the importance of enforcing responsible gambling practices. Xenophon said, “It ought to be done not because it’s a bargaining chip but this is the right thing to do. There are so many lives destroyed, so many people that have been bankrupted, so many families that have broken up and most tragically of all, people take their own lives, self-harm. We will keep pushing this. Ultimately if we don’t get reform in this Parliament, then this becomes a political issue in marginal seats,” he said. With the results of the 2016 federal election causing major headaches for all involved, only time will tell what influence Wilkie and Xenophon manage to have on the call for a gambling reform.